Keeping your office or retail space pest-free is serious business. We’ve designed pest treatment programs tailored for your commercial space. Whether you own a hotel or run an office space, the last thing you need is an infestation that can compromise your business. Having pests in your commercial building can not only put occupants at risk, but it can also interfere with your business’s performance levels. You can eliminate these issues by calling a commercial pest exterminator you trust. 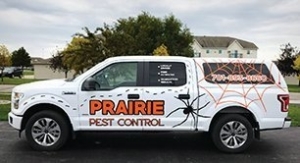 Prairie Pest Control provides business owners with timely pest control services, offering exterior and interior treatments to protect your building from bed bugs, spiders, ants, and more pests. Say goodbye to bugs, and get back to business! What Do You Get with Prairie Pest Control? With Prairie Pest Control’s commercial pest removal services, you get pest control services tailored to your commercial space during any season. Services are available for hotels, office spaces, schools, churches, rental properties, and more! With our worry-free monthly, bi-monthly, and quarterly programs, your business will be consistently pest-free at a reasonable cost. Our friendly staff is on call so that you can reach out for help anytime. Prairie Pest Control is there for you! You get interior and exterior treatments for a variety of pests including spiders, ants, mice and rodents, bees and hornets, crickets, flies, bed bugs, cockroaches, fleas, Asian lady beetles, boxelder bugs, and more. No matter how big or small, Prairie Pest Control will exterminate these critters and help your business get back on its feet. Working with a pest control company can set your business up for a better future. With regular inspections, pests can be identified sooner rather than later. That means you’ll be aware of and fix problems before they get out of control. For a commercial building, that’s critical. You can’t afford to stop all business to deal with severe damage. If ignored, pests can multiply and spread through your building at an alarming rate. Your commercial environment can change over time, and those changes can lead to increased pest activity. Seasonal changes can increase pest activity and so can structural changes caused by construction or renovation. Issues with waste disposal or the transport of bugs from other areas can increase the pest population too. Enlisting commercial pest removal services allows you to understand the sources of pest attraction and what needs to be done to eliminate them and prevent another infestation. When Do You Need Pest Control? You need it not just out of convenience, but importance. Given how busy your commercial space can get, the last thing you want is critters running around and adding undue stress to your workday. Pests can impact your health, with some bugs and rodents carrying infections and diseases. They also can destroy valuables such as office furniture and building structures. While a do-it-yourself project may work for a while, you can get a long-lasting solution from a pest control expert who knows where and how to stop an infestation. Call Prairie Pest Control today and make sure pests leave your business for good!